The horror of the blast that wrecked the Port Huron, Michigan ferry Omar D. Conger and killed four crew members on March 26, 1922, caused people at first to overlook the fact that a miracle had happened. The explosion sent pieces of the red-hot boiler flying hundreds of feet through the air in all directions where they left a path of destruction. Windows were shattered, pedestrians were knocked to the ground, a two-hundred-pound radiator fell through the roof of the Falk Undertaking Parlors where mourners were gathered for a funeral and part of the boiler demolished a nearby house. 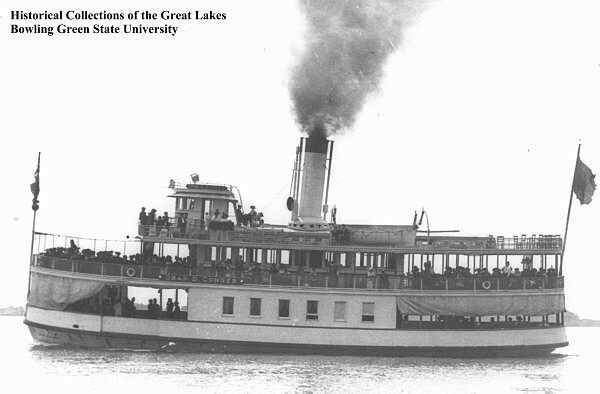 A second steamship, the Cheboygan, with about two hundred passengers, was only a few hundred feet away and approaching the dock. While people were hurt, the miracle was that only four people died. Capt. George W. Waugn, master of the Cheboygan, said he was standing on the bridge, next to the pilot house of the Cheboygan, as the steamer slowly approached its intended mooring next to the Conger when the explosion rocked the waterfront at 2:20 p.m.
"I heard the explosion and looked up and saw a cloud of smoke and dust where the Conger had been. I was deafened and sort of dazed for a few seconds and the next thing I saw her hull was sinking and debris was scattered all around. The boat sunk almost in an instant. It looked as though the explosion blew the boiler right through the side of the hull," Waugn said. Fortunately, none of the passengers or crew members on the Cheboygan were hurt. The William Smith family was not at home when the piece of the boiler crashed down on their house. They were trying out a newly purchased automobile and Smith got it stuck in some mud. While he was perhaps cursing his ill fortune, he was unaware that the delay in returning home was saving his life and the lives of his family. Not only was his home destroyed, but the heat caused what was left of the debris to burn. Everything the Smith family owned was lost. When the radiator fell through the roof at Falk Undertaking Parlors, flying glass and pieces of the roof left several mourners hurt and very frightened. Some were trampled in the panic that followed. Two crew members who should have been aboard the Conger that afternoon were delayed and thus were saved. Capt. William P. Major was in close proximity. He was walking toward the boat and was in front of the Falk Undertaking Parlor when his boat blew up. He saw the big radiator coming down on the building next to him. Shirley R. Busby, an assistant engineer, also was late because he missed the trolley from his home. The ferry Hiawatha, docked near the Conger, was badly damaged. The Conger was scheduled to sail for Sarnia across the St. Clair River, at 3 pm and some passengers had already arrived at the dock for the trip. The four men who died were on board, firing up the boiler and getting the Conger ready for her first trip of the day. They were engineer Ransome A. Campbell, fireman Clifford D. Althouse and deckhands Thomas Buckner and Kenneth R. Crandall. Investigation showed that the boiler was either out of water or that the water was very low when the fires were kindled. The blast occurred when someone opened a valve that let cold water pour into the overheated boiler. The Conger, which bore the name of a U. S. senator from Port Huron, was built at Port Huron just a few hundred feet from where it exploded. It was a small craft, only ninety-two feet in length, and was built to be the ferry it was. The Conger spent forty years faithfully carrying passengers between Port Huron and Sarnia, and making occasional excursions up and down the river.